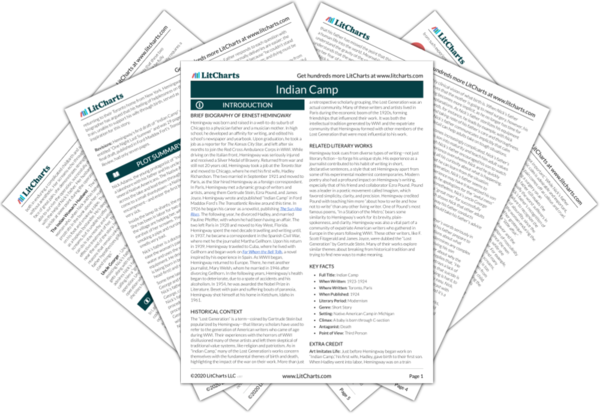 Instant downloads of all 946 LitChart PDFs (including Indian Camp). Welcome to the LitCharts study guide on Ernest Hemingway's Indian Camp. Created by the original team behind SparkNotes, LitCharts are the world's best literature guides. A concise biography of Ernest Hemingway plus historical and literary context for Indian Camp. 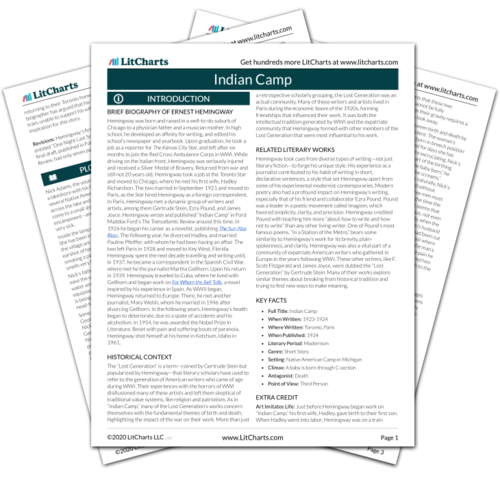 A quick-reference summary: Indian Camp on a single page. In-depth summary and analysis of every of Indian Camp. Visual theme-tracking, too. Explanations, analysis, and visualizations of Indian Camp's themes. Indian Camp's important quotes, sortable by theme, character, or . Description, analysis, and timelines for Indian Camp's characters. Explanations of Indian Camp's symbols, and tracking of where they appear. An interactive data visualization of Indian Camp's plot and themes. Hemingway was born and raised in a well-to-do suburb of Chicago to a physician father and a musician mother. In high school, he developed an affinity for writing, and edited his school’s newspaper and yearbook. Upon graduation, he took a job as a reporter for The Kansas City Star, and left after six months to join the Red Cross Ambulance Corps in WWI. While driving on the Italian front, Hemingway was seriously injured and received a Silver Medal of Bravery. Returned from war and still not 20 years old, Hemingway took a job at the Toronto Star and moved to Chicago, where he met his first wife, Hadley Richardson. The two married in September 1921 and moved to Paris, as the Star hired Hemingway as a foreign correspondent. In Paris, Hemingway met a dynamic group of writers and artists, among them Gertrude Stein, Ezra Pound, and James Joyce. Hemingway wrote and published “Indian Camp” in Ford Maddox Ford’s The Transatlantic Review around this time. In 1926 he began his career as a novelist, publishing The Sun Also Rises. The following year, he divorced Hadley, and married Pauline Pfeiffer, with whom he had been having an affair. The two left Paris in 1928 and moved to Key West, Florida. Hemingway spent the next decade travelling and writing until, in 1937, he became a correspondent in the Spanish Civil War, where met he the journalist Martha Gellhorn. Upon his return in 1939, Hemingway traveled to Cuba, where he lived with Gellhorn and began work on For Whom the Bell Tolls, a novel inspired by his experience in Spain. As WWII began, Hemingway returned to Europe. There, he met another journalist, Mary Welsh, whom he married in 1946 after divorcing Gellhorn. In the following years, Hemingway’s health began to deteriorate, due to a spate of accidents and his alcoholism. In 1954, he was awarded the Nobel Prize in Literature. Beset with pain and suffering bouts of paranoia, Hemingway shot himself at his home in Ketchum, Idaho in 1961. 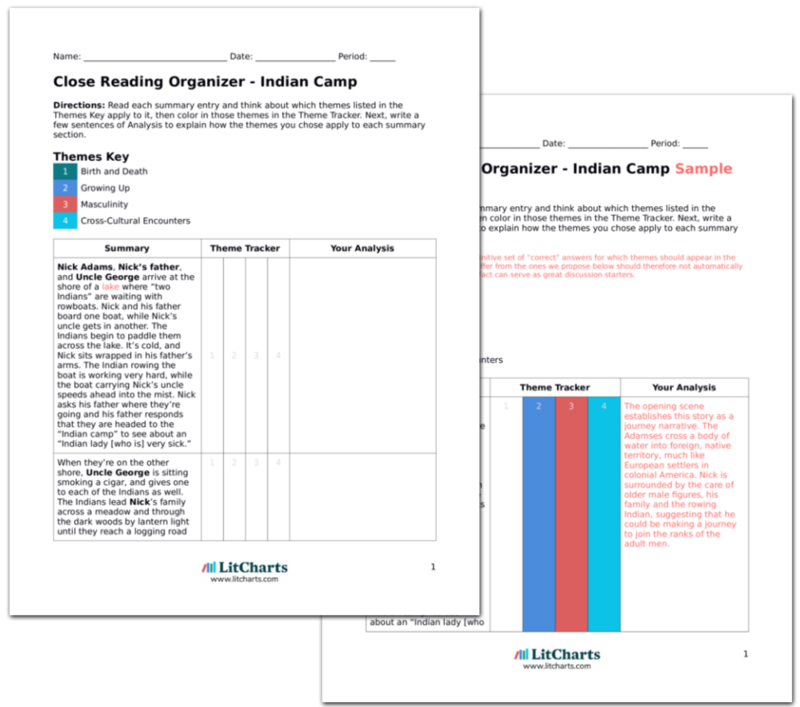 Get the entire Indian Camp LitChart as a printable PDF. The “Lost Generation” is a term—coined by Gertrude Stein but popularized by Hemingway—that literary scholars have used to refer to the generation of American writers who came of age during WWI. Their experiences with the horrors of WWI disillusioned many of these artists and left them skeptical of traditional value systems, like religion and patriotism. As in “Indian Camp,” many of the Lost Generation’s works concern themselves with the fundamental themes of birth and death, highlighting the impact of the war on their work. More than just a retrospective scholarly grouping, the Lost Generation was an actual community. Many of these writers and artists lived in Paris during the economic boom of the 1920s, forming friendships that influenced their work. It was both the intellectual tradition generated by WWI and the expatriate community that Hemingway formed with other members of the Lost Generation that were most influential to his work. Hemingway took cues from diverse types of writing—not just literary fiction—to forge his unique style. His experience as a journalist contributed to his habit of writing in short, declarative sentences, a style that set Hemingway apart from some of his experimental modernist contemporaries. Modern poetry also had a profound impact on Hemingway’s writing, especially that of his friend and collaborator Ezra Pound. Pound was a leader in a poetic movement called Imagism, which favored simplicity, clarity, and precision. Hemingway credited Pound with teaching him more “about how to write and how not to write” than any other living writer. One of Pound’s most famous poems, “In a Station of the Metro,” bears some similarity to Hemingway’s work for its brevity, plain-spokenness, and clarity. Hemingway was also a vital part of a community of expatriate American writers who gathered in Europe in the years following WWI. These other writers, like F. Scott Fitzgerald and James Joyce, were dubbed the “Lost Generation” by Gertrude Stein. Many of their works explore similar themes about breaking from historical tradition and trying to find new ways to make meaning. Art Imitates Life: Just before Hemingway began work on “Indian Camp,” his first wife, Hadley, gave birth to their first son. When Hadley went into labor, Hemingway was on a train returning to their Toronto home from New York. Hemingway’s biographer has argued that his feeling of helplessness on the train, unable to support his wife through birth, served as inspiration for this story. Revisions: Hemingway’s first draft of “Indian Camp” was entitled “One Night Last Summer” and was 29 pages long. The final draft, published in Ford Maddox Fort’s Transatlantic Review, had only seven pages. Browne, Matthew. "Indian Camp." LitCharts. LitCharts LLC, 18 Jul 2018. Web. 11 Dec 2018. Browne, Matthew. "Indian Camp." LitCharts LLC, July 18, 2018. Retrieved December 11, 2018. https://www.litcharts.com/lit/indian-camp.